Do you ever got into a situation where you have accidentally deleted a file ? It happens with many of us, sometimes by mistake we accidentally press wrong keys and our file is deleted. There is no way to recover that file because it is permanently deleted and it is not available in recycle bin to restore. So, How to recover deleted file ? Actually when a file is permanently deleted from the computer still its clusters are left in computer and with few tweaks we can recover those deleted files. Recuva is a freeware file recovery software developed by the same company which developed “CCleaner”. 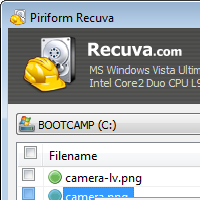 By using Recuva you can easily recover permanently deleted files. It is free and user friendly. It also comes in commercial version with support of software. Tip: You should always use Deep Scan method to increase chance for recovering your file.